Excuse the Chrono Trigger art. Couldn't make anything of my own, so I stole, erm "borrowed" some art. Also, using FF7 and OoT Sound effects for the moment. Just looking for feedback on the basic concept. I guess the idea I am working toward would be a LttP x Crisis Core FF7 x Chrono Trigger x Kingdom Hearts combat system? Won't really feel that way until further iterations. I can only assume the glitch was because you attempted to swing sword before it was completely out. That glitch has been fixed. 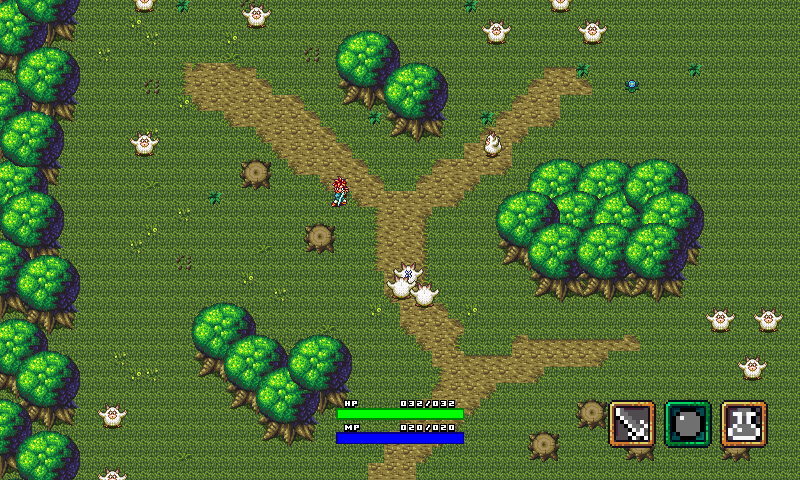 Seems similar-ish to Secret of Mana. That's all I really have to say on it. I liked it. The combat felt pretty good, like the sword felt pretty impactful, and the auto-targeting of the nearest enemy worked well for me, I liked that, felt like the sword had a generous range. Was the flask item supposed to do anything? I figure not. That's a compliment. Though, as I expand on combos in battle, it might end of feeling closer to Sword of Mana/Kingdom Hearts Chain of Memories. I expect the attacking part of battle to speed up once I implement combos. Yeah, no flask stuff yet. It's just there for show. There will end up being a spell menu as well. I am thinking that a maximum of five equippable spells is plenty - I am even leaning more toward only three. I have not been able to reproduce your crash. I have fixed some bugs here and there that I find on my end, so maybe it is fixed. MIght have something to do with hitting an enemy when they are dead. This has been fixed on my end but not in newest uploaded version. I will be working on the sword range even more. If the enemy gets too close, the sword no longer works. Might just make a collision with player while they are in attack animation if the enemy is in your face. Right now, the system checks based on the sword swipe sprite, not the player. WIll look into it.